WINS is a facility that provides resolution of a NetBIOS name to its IP address. WINS is like a Dynamic-DNS service for NetBIOS networking names. MS Windows 2000 and later versions can be configured to operate with no NetBIOS over TCP/IP. Samba-3 and later versions also support this mode of operation. When the use of NetBIOS over TCP/IP has been disabled, the primary means for resolution of MS Windows machine names is via DNS and Active Directory. The following information assumes that your site is running NetBIOS over TCP/IP. For many MS Windows network administrators, that statement sums up their feelings about NetBIOS networking precisely. For those who mastered NetBIOS networking, its fickle nature was just par for the course. For those who never quite managed to tame its lusty features, NetBIOS is like Paterson's Curse. For those not familiar with botanical problems in Australia, Paterson's Curse, Echium plantagineum, was introduced to Australia from Europe during the mid-19th century. Since then it has spread rapidly. The high seed production, with densities of thousands of seeds per square meter, a seed longevity of more than 7 years, and an ability to germinate at any time of year, given the right conditions, are some of the features that make it such a persistent weed. In this chapter we explore vital aspects of Server Message Block (SMB) networking with a particular focus on SMB as implemented through running NetBIOS (Network Basic Input/Output System) over TCP/IP. Since Samba does not implement SMB or NetBIOS over any other protocols, we need to know how to configure our network environment and simply remember to use nothing but TCP/IP on all our MS Windows network clients. Samba provides the ability to implement a WINS (Windows Internetworking Name Server) and implements extensions to Microsoft's implementation of WINS. These extensions help Samba to effect stable WINS operations beyond the normal scope of MS WINS. WINS is exclusively a service that applies only to those systems that run NetBIOS over TCP/IP. MS Windows 200x/XP have the capacity to operate with support for NetBIOS disabled, in which case WINS is of no relevance. Samba supports this also. For those networks on which NetBIOS has been disabled (i.e., WINS is not required), the use of DNS is necessary for hostname resolution. To most people, browsing means they can see the MS Windows and Samba servers in the Network Neighborhood, and when the computer icon for a particular server is clicked, it opens up and shows the shares and printers available on the target server. MS Windows machines register their presence to the network. Machines announce themselves to other machines on the network. One or more machines on the network collate the local announcements. The client machine finds the machine that has the collated list of machines. The client machine is able to resolve the machine names to IP addresses. The client machine is able to connect to a target machine. Those marked with an (*) are the only options that commonly may need to be modified. Even if none of these parameters is set, nmbd will still do its job. For Samba, the WINS Server and WINS Support are mutually exclusive options. When nmbd is started it will fail to execute if both options are set in the smb.conf file. The nmbd understands that when it spawns an instance of itself to run as a WINS server that it has to use its own WINS server also. All MS Windows networking uses SMB-based messaging. SMB messaging may be implemented with or without NetBIOS. MS Windows 200x supports NetBIOS over TCP/IP for backwards compatibility. Microsoft appears intent on phasing out NetBIOS support. Samba implements NetBIOS, as does MS Windows NT/200x/XP, by encapsulating it over TCP/IP. NetBIOS-based networking uses broadcast messaging to effect browse list management. When running NetBIOS over TCP/IP, this uses UDP-based messaging. UDP messages can be broadcast or unicast. Normally, only unicast UDP messaging can be forwarded by routers. The remote announce parameter to smb.conf helps to project browse announcements to remote network segments via unicast UDP. Similarly, the remote browse sync parameter of smb.conf implements browse list collation using unicast UDP. b-node (type 0x01): The Windows client will use only NetBIOS broadcast requests using UDP broadcast. p-node (type 0x02): The Windows client will use point-to-point (NetBIOS unicast) requests using UDP unicast directed to a WINS server. m-node (type 0x04): The Windows client will first use NetBIOS broadcast requests using UDP broadcast, then it will use (NetBIOS unicast) requests using UDP unicast directed to a WINS server. h-node (type 0x08): The Windows client will use (NetBIOS unicast) requests using UDP unicast directed to a WINS server, then it will use NetBIOS broadcast requests using UDP broadcast. The default Windows network client (or server) network configuration enables NetBIOS over TCP/IP and b-node configuration. The use of WINS makes most sense with h-node (hybrid mode) operation so that in the event of a WINS breakdown or non-availability, the client can use broadcast-based name resolution. In those networks where Samba is the only SMB server technology, wherever possible nmbd should be configured on one machine as the WINS server. This makes it easy to manage the browsing environment. If each network segment is configured with its own Samba WINS server, then the only way to get cross-segment browsing to work is by using the remote announce and the remote browse sync parameters to your smb.conf file. If only one WINS server is used for an entire multisegment network, then the use of the remote announce and the remote browse sync parameters should not be necessary. As of Samba-3, WINS replication is being worked on. The bulk of the code has been committed, but it still needs maturation. This is not a supported feature of the Samba-3.0.20 release. Hopefully, this will become a supported feature of one of the Samba-3 release series. The delay is caused by the fact that this feature has not been of sufficient significance to inspire someone to pay a developer to complete it. Right now Samba WINS does not support MS-WINS replication. This means that when setting up Samba as a WINS server, there must only be one nmbd configured as a WINS server on the network. Some sites have used multiple Samba WINS servers for redundancy (one server per subnet) and then used remote browse sync and remote announce to effect browse list collation across all segments. Note that this means clients will only resolve local names and must be configured to use DNS to resolve names on other subnets in order to resolve the IP addresses of the servers they can see on other subnets. This setup is not recommended but is mentioned as a practical consideration (i.e., an “if all else fails” scenario). NetBIOS over TCP/IP is an ugly and difficult to manage protocol. Its replacement, NetBIOSless SMB over TCP/IP is not without its own manageability concerns. NetBIOS based networking is a life of compromise and trade-offs. WINS stores information that cannot be stored in DNS; consequently, DNS is a poor substitute for WINS given that when NetBIOS over TCP/IP is used, Windows clients are designed to use WINS. Lastly, take note that browse lists are a collection of unreliable broadcast messages that are repeated at intervals of not more than 15 minutes. This means that it will take time to establish a browse list, and it can take up to 45 minutes to stabilize, particularly across network segments. Checks the hosts file. It is located in %SystemRoot%\System32\Drivers\etc. Checks the NetBIOS name cache. Does a broadcast name lookup over UDP. Looks up entries in LMHOSTS, located in %SystemRoot%\System32\Drivers\etc. Given the nature of how the NetBIOS over TCP/IP protocol is implemented, only WINS is capable of resolving with any reliability name lookups for service-oriented names such as TEMPTATION<1C> a NetBIOS name query that seeks to find network logon servers. DNS has no concept of service-oriented names such as this. In fact, the Microsoft ADS implementation specifically manages a whole range of extended service-oriented DNS entries. This type of facility is not implemented and is not supported for the NetBIOS over TCP/IP protocol namespace. All TCP/IP-enabled systems use various forms of hostname resolution. The primary methods for TCP/IP hostname resolution involve either a static file (/etc/hosts) or the Domain Name System (DNS). DNS is the technology that makes the Internet usable. DNS-based hostname resolution is supported by nearly all TCP/IP-enabled systems. Only a few embedded TCP/IP systems do not support DNS. Windows 200x/XP can register its hostname with a Dynamic DNS server (DDNS). It is possible to force register with a dynamic DNS server in Windows 200x/XP using ipconfig /registerdns. With Active Directory, a correctly functioning DNS server is absolutely essential. In the absence of a working DNS server that has been correctly configured, MS Windows clients and servers will be unable to locate each other, so network services consequently will be severely impaired. Use of raw SMB over TCP/IP (No NetBIOS layer) can be done only with Active Directory domains. Samba is not an Active Directory domain controller: ergo, it is not possible to run Samba as a domain controller and at the same time not use NetBIOS. Where Samba is used as an Active Directory domain member server (DMS) it is possible to configure Samba to not use NetBIOS over TCP/IP. A Samba DMS can integrate fully into an Active Directory domain, however, if NetBIOS over TCP/IP is disabled, it is necessary to manually create appropriate DNS entries for the Samba DMS because they will not be automatically generated either by Samba, or by the ADS environment. The use of DDNS is highly recommended with Active Directory, in which case the use of BIND9 is preferred for its ability to adequately support the SRV (service) records that are needed for Active Directory. Of course, when running ADS, it makes sense to use Microsoft's own DDNS server because of the natural affinity between ADS and MS DNS. This provides the address of the Windows NT PDC for the domain. Resolves the addresses of global catalog servers in the domain. Provides list of domain controllers based on sites. Enumerates list of domain controllers that have the writable copies of the Active Directory data store. Entry used by MS Windows clients to locate machines using the global unique identifier. Used by Microsoft Windows clients to locate the site configuration-dependent global catalog server. _kerberos._udp.quenya.org Used to contact the KDC server via UDP. This entry must list port 88 for each KDC. _kpasswd._udp.quenya.org Used to locate the kpasswd server when a user password change must be processed. This record must list port 464 on the master KDC. _kerberos._tcp.quenya.org Used to locate the KDC server via TCP. This entry must list port 88 for each KDC. _ldap._tcp.quenya.org Used to locate the LDAP service on the PDC. This record must list port 389 for the PDC. _kpasswd._tcp.quenya.org Used to locate the kpasswd server to permit user password changes to be processed. This must list port 464. _gc._tcp.quenya.org Used to locate the global catalog server for the top of the domain. This must list port 3268. The following records are also used by the Windows domain member client to locate vital services on the Windows ADS domain controllers. _ldap._tcp.dc._msdcs.quenya.org. 600 IN SRV 0 100 389 frodo.quenya.org. _ldap._tcp.dc._msdcs.quenya.org. 600 IN SRV 0 100 389 noldor.quenya.org. MS Windows machines register their NetBIOS names (i.e., the machine name for each service type in operation) on startup. The exact method by which this name registration takes place is determined by whether or not the MS Windows client/server has been given a WINS server address, whether or not LMHOSTS lookup is enabled, whether or not DNS for NetBIOS name resolution is enabled, and so on. In the case where there is no WINS server, all name registrations as well as name lookups are done by UDP broadcast. This isolates name resolution to the local subnet, unless LMHOSTS is used to list all names and IP addresses. In such situations, Samba provides a means by which the Samba server name may be forcibly injected into the browse list of a remote MS Windows network (using the remote announce parameter). Where a WINS server is used, the MS Windows client will use UDP unicast to register with the WINS server. Such packets can be routed, and thus WINS allows name resolution to function across routed networks. During the startup process, an election takes place to create a local master browser (LMB) if one does not already exist. On each NetBIOS network one machine will be elected to function as the domain master browser (DMB). This domain browsing has nothing to do with MS security Domain Control. Instead, the DMB serves the role of contacting each LMB (found by asking WINS or from LMHOSTS) and exchanging browse list contents. This way every master browser will eventually obtain a complete list of all machines that are on the network. Every 11 to 15 minutes an election is held to determine which machine will be the master browser. By the nature of the election criteria used, the machine with the highest uptime, or the most senior protocol version or other criteria, will win the election as DMB. Where a WINS server is used, the DMB registers its IP address with the WINS server using the name of the domain and the NetBIOS name type 1B (e.g., DOMAIN<1B>). All LMBs register their IP addresses with the WINS server, also with the name of the domain and the NetBIOS name type of 1D. The 1B name is unique to one server within the domain security context, and only one 1D name is registered for each network segment. Machines that have registered the 1D name will be authoritive browse list maintainers for the network segment they are on. The DMB is responsible for synchronizing the browse lists it obtains from the LMBs. Clients wishing to browse the network make use of this list but also depend on the availability of correct name resolution to the respective IP address or addresses. Any configuration that breaks name resolution and/or browsing intrinsics will annoy users because they will have to put up with protracted inability to use the network services. Samba supports a feature that allows forced synchronization of browse lists across routed networks using the remote browse sync parameter in the smb.conf file. This causes Samba to contact the LMB on a remote network and to request browse list synchronization. This effectively bridges two networks that are separated by routers. The two remote networks may use either broadcast-based name resolution or WINS-based name resolution, but it should be noted that the remote browse sync parameter provides browse list synchronization and that is distinct from name-to-address resolution. In other words, for cross-subnet browsing to function correctly, it is essential that a name-to-address resolution mechanism be provided. This mechanism could be via DNS, /etc/hosts, and so on. To configure cross-subnet browsing on a network containing machines in a workgroup, not an NT domain, you need to set up one Samba server to be the DMB (note that this is not the same as a Primary Domain Controller, although in an NT domain the same machine plays both roles). The role of a DMB is to collate the browse lists from LMB on all the subnets that have a machine participating in the workgroup. Without one machine configured as a DMB, each subnet would be an isolated workgroup unable to see any machines on another subnet. It is the presence of a DMB that makes cross-subnet browsing possible for a workgroup. The DMB may be the same machine as the WINS server, if necessary. Do not do this for more than one Samba server on each subnet, or they will war with each other over which is to be the LMB. The local master parameter allows Samba to act as a LMB. The preferred master causes nmbd to force a browser election on startup and the os level parameter sets Samba high enough so it should win any browser elections. If you have an NT machine on the subnet that you wish to be the LMB, you can disable Samba from becoming an LMB by setting the following options in the [global] section of the smb.conf file as shown in smb.conf for Not Being a Master Browser. If you are adding Samba servers to a Windows NT domain, then you must not set up a Samba server as a DMB. By default, a Windows NT PDC for a domain is also the DMB for that domain. Network browsing may break if a Samba server other than the PDC registers the DMB NetBIOS name (DOMAIN<1B>) with WINS. If you wish to have a Samba server fight the election with machines on the same subnet, you may set the os level parameter to lower levels. By doing this you can tune the order of machines that will become LMBs if they are running. For more details on this, refer to Forcing Samba to Be the Master. An os level of two would make it beat Windows for Workgroups and Windows 9x/Me, but not MS Windows NT/200x Server. An MS Windows NT/200x Server domain controller uses level 32. The maximum os level is 255. If you want Samba to force an election on startup, set the preferred master global option in smb.conf to yes. Samba will then have a slight advantage over other potential master browsers that are not preferred master browsers. Use this parameter with care, because if you have two hosts (whether they are Windows 9x/Me or NT/200x/XP or Samba) on the same local subnet both set with preferred master to yes, then periodically and continually they will force an election in order to become the LMB. If you want Samba to be a DMB, then it is recommended that you also set preferred master to yes, because Samba will not become a DMB for the whole of your LAN or WAN if it is not also a LMB on its own broadcast isolated subnet. It is possible to configure two Samba servers to attempt to become the DMB for a domain. The first server that comes up will be the DMB. All other Samba servers will attempt to become the DMB every 5 minutes. They will find that another Samba server is already the DMB and will fail. This provides automatic redundancy should the current DMB fail. The network bandwidth overhead of browser elections is relatively small, requiring approximately four UDP packets per machine per election. The maximum size of a UDP packet is 576 bytes. The domain master browser is responsible for collating the browse lists of multiple subnets so browsing can occur between subnets. You can make Samba act as the domain master browser by setting domain master = yes in smb.conf. By default it will not be a domain master browser. Do not set Samba to be the domain master for a workgroup that has the same name as an NT/200x domain. If Samba is configured to be the domain master for a workgroup that is present on the same network as a Windows NT/200x domain that has the same name, network browsing problems will certainly be experienced. When Samba is the domain master and the master browser, it will listen for master announcements (made roughly every 12 minutes) from LMBs on other subnets and then contact them to synchronize browse lists. If you want Samba to be the domain master, you should also set the os level high enough to make sure it wins elections, and set preferred master to yes, to get Samba to force an election on startup. LMBs will be unable to find a DMB because they will be looking only on the local subnet. If a client happens to get hold of a domain-wide browse list and a user attempts to access a host in that list, it will be unable to resolve the NetBIOS name of that host. LMBs will contact the WINS server and, as long as Samba has registered that it is a DMB with the WINS server, the LMB will receive Samba's IP address as its DMB. When a client receives a domain-wide browse list and a user attempts to access a host in that list, it will contact the WINS server to resolve the NetBIOS name of that host. As long as that host has registered its NetBIOS name with the same WINS server, the user will be able to see that host.. If your network uses a zero-based broadcast address (for example, if it ends in a 0), then you will strike problems. Windows for Workgroups does not seem to support a zeros broadcast, and you will probably find that browsing and name lookups will not work. The bind interfaces only = Yes is necessary to exclude TCP/IP session services (ports 135, 139, and 445) over the interfaces that are not specified. Please be aware that nmbd will listen for incoming UDP port 137 packets on the unlisted interfaces, but it will not answer them. It will, however, send its broadcast packets over the unlisted interfaces. Total isolation of ethernet interface requires the use of a firewall to block ports 137 and 138 (UDP), and ports 135, 139, and 445 (TCP) on all network interfaces that must not be able to access the Samba server. is either the LMB IP address or the broadcast address of the remote network. That is, the LMB is at 192.168.1.23, or the address could be given as 172.16.21.255 where the netmask is assumed to be 24 bits (255.255.255.0). When the remote announcement is made to the broadcast address of the remote network, every host will receive our announcements. This is noisy and therefore undesirable but may be necessary if we do not know the IP address of the remote LMB. is optional and can be either our own workgroup or that of the remote network. If you use the workgroup name of the remote network, our NetBIOS machine names will end up looking like they belong to that workgroup. This may cause name resolution problems and should be avoided. The remote browse sync parameter of smb.conf is used to announce to another LMB that it must synchronize its NetBIOS name list with our Samba LMB. This works only if the Samba server that has this option is simultaneously the LMB on its network segment. where 192.168.10.40 is either the IP address of the remote LMB or the network broadcast address of the remote segment. Use of WINS (either Samba WINS or MS Windows NT Server WINS) is highly recommended. Every NetBIOS machine registers its name together with a name_type value for each of several types of service it has available. It registers its name directly as a unique (the type 0x03) name. It also registers its name if it is running the LanManager-compatible server service (used to make shares and printers available to other users) by registering the server (the type 0x20) name. All NetBIOS names are up to 15 characters in length. The name_type variable is added to the end of the name, thus creating a 16 character name. Any name that is shorter than 15 characters is padded with spaces to the 15th character. Thus, all NetBIOS names are 16 characters long (including the name_type information). WINS can store these 16-character names as they get registered. A client that wants to log onto the network can ask the WINS server for a list of all names that have registered the NetLogon service name_type. This saves broadcast traffic and greatly expedites logon processing. Since broadcast name resolution cannot be used across network segments, this type of information can only be provided via WINS or via a statically configured lmhosts file that must reside on all clients in the absence of WINS. WINS also forces browse list synchronization by all LMBs. LMBs must synchronize their browse list with the DMB, and WINS helps the LMB to identify its DMB. By definition this will work only within a single workgroup. Note that the DMB has nothing to do with what is referred to as an MS Windows NT domain. The latter is a reference to a security environment, while the DMB refers to the master controller for browse list information only. WINS will work correctly only if every client TCP/IP protocol stack is configured to use the WINS servers. Any client that is not configured to use the WINS server will continue to use only broadcast-based name registration, so WINS may never get to know about it. In any case, machines that have not registered with a WINS server will fail name-to-address lookup attempts by other clients and will therefore cause workstation access errors. To configure Samba as a WINS server, just add wins support = yes to the smb.conf file [global] section. To configure Samba to register with a WINS server, just add wins server = 10.0.0.18 to your smb.conf file [global] section. Never use wins support = yes together with wins server = 10.0.0.18 particularly not using its own IP address. Specifying both will cause nmbd to refuse to start! Versions of Samba prior to 1.9.17 had this parameter default to yes. If you have any older versions of Samba on your network, it is strongly suggested you upgrade to a recent version, or at the very least set the parameter to “no” on all these machines. Machines configured with wins support = yes will keep a list of all NetBIOS names registered with them, acting as a DNS for NetBIOS names. It is strongly recommended to set up only one WINS server. Do not set the wins support = yes option on more than one Samba server on a network. To configure Windows NT/200x Server as a WINS server, install and configure the WINS service. See the Windows NT/200x documentation for details. Windows NT/200x WINS servers can replicate to each other, allowing more than one to be set up in a complex subnet environment. Because Microsoft refuses to document the replication protocols, Samba cannot currently participate in these replications. 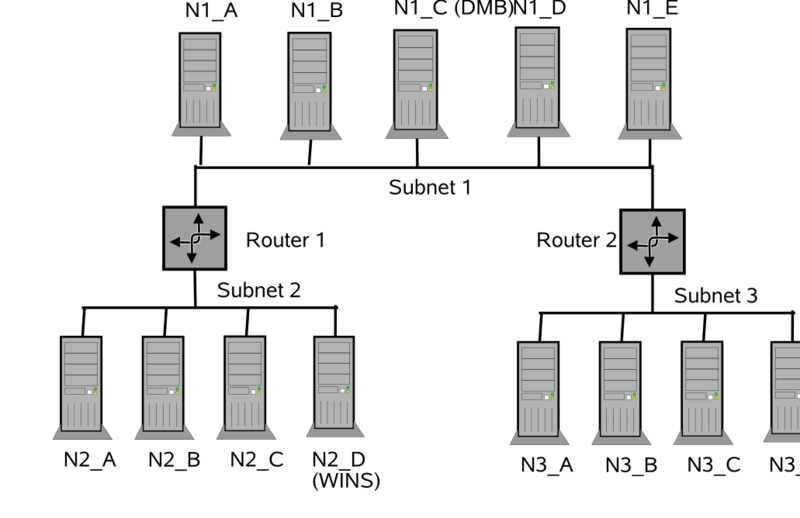 It is possible that a Samba-to-Samba WINS replication protocol may be defined in the future, in which case more than one Samba machine could be set up as a WINS server. Currently only one Samba server should have the wins support = yes parameter set. where <name or IP address> is either the DNS name of the WINS server machine or its IP address. This line must not be set in the smb.conf file of the Samba server acting as the WINS server itself. If you set both the wins support = yes option and the wins server = <name> option then nmbd will fail to start. There are two possible scenarios for setting up cross-subnet browsing. The first details setting up cross-subnet browsing on a network containing Windows 9x/Me, Samba, and Windows NT/200x machines that are not configured as part of a Windows NT domain. The second details setting up cross-subnet browsing on networks that contain NT domains. Samba-3 does not support native WINS replication. There was an approach to implement it, called wrepld, but it was never ready for action and the development is now discontinued. Meanwhile, there is a project named samba4WINS, which makes it possible to run the Samba-4 WINS server parallel to Samba-3 since version 3.0.21. More information about samba4WINS are available at http://ftp.sernet.de/pub/samba4WINS. Adding static entries to your Samba WINS server is actually fairly easy. All you have to do is add a line to wins.dat, typically located in /usr/local/samba/var/locks or /var/run/samba. where NAME is the NetBIOS name, TYPE is the NetBIOS type, TTL is the time-to-live as an absolute time in seconds, ADDRESS+ is one or more addresses corresponding to the registration, and FLAGS are the NetBIOS flags for the registration. A change that has been made to the wins.dat will not take effect until nmbd has been restarted. It should be noted that since the wins.dat file changes dynamically, nmbd should be stopped before editting this file. Do not forget to restart nmbd when this file has been editted. The NetBIOS flags may be interpreted as additive hexadecimal values: 00 - Broadcast node registration, 20 - Peer node registration, 40 - Meta node registration, 60 - Hybrid node registration, 02 - Permanent name, 04 - Active name, 80 - Group name. The 'R' indicates this is a registration record. Thus 66R means: Hybrid node active and permanent NetBIOS name. These values may be found in the nameserv.h header file from the Samba source code repository. These are the values for the NB flags. Though this method works with early Samba-3 versions, there is a possibility that it may change in future versions if WINS replication is added. The following hints should be carefully considered because they are stumbling points for many new network administrators. A common cause of browsing problems results from the installation of more than one protocol on an MS Windows machine. Do not use more than one protocol on MS Windows clients. Every NetBIOS machine takes part in a process of electing the LMB (and DMB) every 15 minutes. A set of election criteria is used to determine the order of precedence for winning this election process. A machine running Samba or Windows NT will be biased, so the most suitable machine will predictably win and thus retain its role. The election process is fought out, so to speak over every NetBIOS network interface. In the case of a Windows 9x/Me machine that has both TCP/IP and IPX installed and has NetBIOS enabled over both protocols, the election will be decided over both protocols. As often happens, if the Windows 9x/Me machine is the only one with both protocols, then the LMB may be won on the NetBIOS interface over the IPX protocol. Samba will then lose the LMB role because Windows 9x/Me will insist it knows who the LMB is. Samba will then cease to function as an LMB, and browse list operation on all TCP/IP-only machines will therefore fail. Windows 95, 98, 98se, and Me are referred to generically as Windows 9x/Me. The Windows NT4, 200x, and XP use common protocols. These are roughly referred to as the Windows NT family, but it should be recognized that 2000 and XP/2003 introduce new protocol extensions that cause them to behave differently from MS Windows NT4. Generally, where a server does not support the newer or extended protocol, these will fall back to the NT4 protocols. The safest rule of all to follow is: Use only one protocol! LMHOSTS static and hard to maintain. Broadcast uses UDP and cannot resolve names across remote segments. Static /etc/hosts hard to maintain and lacks name_type info. DNS is a good choice but lacks essential NetBIOS name_type information. where “host” refers to the native methods used by the UNIX system to implement the gethostbyname() function call. This is normally controlled by /etc/host.conf, /etc/nsswitch.conf and /etc/resolv.conf. SMB networking provides a mechanism by which clients can access a list of machines in a network called browse list. This list contains machines that are ready to offer file and/or print services to other machines within the network. It therefore does not include machines that aren't currently able to do server tasks. The browse list is heavily used by all SMB clients. Configuration of SMB browsing has been problematic for some Samba users, hence this document. MS Windows 2000 and later versions, as with Samba-3 and later versions, can be configured to not use NetBIOS over TCP/IP. When configured this way, it is imperative that name resolution (using DNS/LDAP/ADS) be correctly configured and operative. Browsing will not work if name resolution from SMB machine names to IP addresses does not function correctly. Where NetBIOS over TCP/IP is enabled, use of a WINS server is highly recommended to aid the resolution of NetBIOS (SMB) names to IP addresses. WINS allows remote segment clients to obtain NetBIOS name_type information that cannot be provided by any other means of name resolution. Samba facilitates browsing. The browsing is supported by nmbd and is also controlled by options in the smb.conf file. Samba can act as an LMB for a workgroup, and the ability to support domain logons and scripts is now available. Samba can also act as a DMB for a workgroup. This means that it will collate lists from LMBs into a wide-area network server list. In order for browse clients to resolve the names they may find in this list, it is recommended that both Samba and your clients use a WINS server. Do not set Samba to be the domain master for a workgroup that has the same name as an NT Domain. On each wide-area network, you must only ever have one DMB per workgroup, regardless of whether it is NT, Samba, or any other type of domain master that is providing this service. nmbd can be configured as a WINS server, but it is not necessary to specifically use Samba as your WINS server. MS Windows NT4, Server or Advanced Server 200x can be configured as your WINS server. In a mixed NT/200x server and Samba environment on a WAN, it is recommended that you use the Microsoft WINS server capabilities. In a Samba-only environment, it is recommended that you use one and only one Samba server as the WINS server. To get browsing to work, you need to run nmbd as usual, but must use the workgroup option in smb.conf to control what workgroup Samba becomes a part of. Samba also has a useful option for a Samba server to offer itself for browsing on another subnet. It is recommended that this option is used only for “unusual” purposes: announcements over the Internet, for example. See remote announce in the smb.conf man page. If something does not work, the log.nmbd file will help to track down the problem. Try a log level of 2 or 3 for finding problems. Also note that the current browse list usually gets stored in text form in a file called browse.dat. If it does not work, you should still be able to type the server name as \\SERVER in filemanager, then press enter, and filemanager should display the list of available shares. Some people find browsing fails because they do not have the global guest account set to a valid account. Remember that the IPC$ connection that lists the shares is done as guest and so you must have a valid guest account. The IPC$ share is used by all SMB/CIFS clients to obtain the list of resources that is available on the server. This is the source of the list of shares and printers when browsing an SMB/CIFS server (also Windows machines) using the Windows Explorer to browse resources through the Windows Network Neighborhood (also called My Network Places) through to a Windows server. At this point, the client has opened a connection to the \\server\IPC4 resource. Clicking on a share will then open up a connection to the \\server\share. MS Windows 2000 and later (as with Samba) can be configured to disallow anonymous (i.e., guest account) access to the IPC$ share. In that case, the MS Windows 2000/XP/2003 machine acting as an SMB/CIFS client will use the name of the currently logged-in user to query the IPC$ share. MS Windows 9x/Me clients are not able to do this and thus will not be able to browse server resources. Since the release of Samba 1.9.17 (alpha1), Samba has supported the replication of browse lists across subnet boundaries. This section describes how to set this feature up in different settings. To see browse lists that span TCP/IP subnets (i.e., networks separated by routers that do not pass broadcast traffic), you must set up at least one WINS server. The WINS server acts as a DNS for NetBIOS names. This will allow NetBIOS name-to-IP address translation to be completed by a direct query of the WINS server. This is done via a directed UDP packet on port 137 to the WINS server machine. The WINS server avoids the necessity of default NetBIOS name-to-IP address translation, which is done using UDP broadcasts from the querying machine. This means that machines on one subnet will not be able to resolve the names of machines on another subnet without using a WINS server. The Samba hacks, remote browse sync, and remote announce are designed to get around the natural limitations that prevent UDP broadcast propagation. The hacks are not a universal solution and they should not be used in place of WINS, they are considered last resort methods. Remember, for browsing across subnets to work correctly, all machines, be they Windows 95, Windows NT, or Samba servers, must have the IP address of a WINS server given to them by a DHCP server or by manual configuration: for Windows 9x/Me and Windows NT/200x/XP, this is in the TCP/IP Properties, under Network settings; for Samba, this is in the smb.conf file. It is possible to operate Samba-3 without NetBIOS over TCP/IP. If you do this, be warned that if used outside of MS ADS, this will forgo network browsing support. ADS permits network browsing support through DNS, providing appropriate DNS records are inserted for all Samba servers. Cross-subnet browsing is a complicated dance, containing multiple moving parts. It has taken Microsoft several years to get the code that correctly achieves this, and Samba lags behind in some areas. Samba is capable of cross-subnet browsing when configured correctly. Consider a network set up as in Cross-Subnet Browsing Example. This consists of three subnets (1, 2, 3) connected by two routers (R1, R2), which do not pass broadcasts. Subnet 1 has five machines on it, subnet 2 has four machines, and subnet 3 has four machines. Assume for the moment that all machines are configured to be in the same workgroup (for simplicity's sake). Machine N1_C on subnet 1 is configured as the DMB (i.e., it will collate the browse lists for the workgroup). Machine N2_D is configured as a WINS server, and all the other machines are configured to register their NetBIOS names with it. As these machines are booted up, elections for master browsers take place on each of the three subnets. Assume that machine N1_C wins on subnet 1, N2_B wins on subnet 2, and N3_D wins on subnet 3. These machines are known as LMBs for their particular subnet. N1_C has an advantage in winning as the LMB on subnet 1 because it is set up as DMB. On each of the three networks, machines that are configured to offer sharing services will broadcast that they are offering these services. The LMB on each subnet will receive these broadcasts and keep a record of the fact that the machine is offering a service. This list of records is the basis of the browse list. For this case, assume that all the machines are configured to offer services, so all machines will be on the browse list. For each network, the LMB on that network is considered authoritative for all the names it receives via local broadcast. This is because a machine seen by the LMB via a local broadcast must be on the same network as the Local Master Browser and thus is a trusted and verifiable resource. Machines on other networks that the LMBs learn about when collating their browse lists have not been directly seen. These records are called non-authoritative. At this point the browse lists appear as shown in Browse Subnet Example 1 (these are the machines you would see in your network neighborhood if you looked in it on a particular network right now). At this point all the subnets are separate, and no machine is seen across any of the subnets. Now examine subnet 2 in Browse Subnet Example 2. As soon as N2_B has become the LMB, it looks for a DMB with which to synchronize its browse list. It does this by querying the WINS server (N2_D) for the IP address associated with the NetBIOS name WORKGROUP<1B>. This name was registered by the DMB (N1_C) with the WINS server as soon as it was started. Servers with an (*) after them are non-authoritative names. At this point users looking in their Network Neighborhood on subnets 1 or 2 will see all the servers on both; users on subnet 3 will still see only the servers on their own subnet. At this point, users looking in their Network Neighborhood on subnets 1 or 3 will see all the servers on all subnets, while users on subnet 2 will still see only the servers on subnets 1 and 2, but not 3. Finally, the LMB for subnet 2 (N2_B) will sync again with the DMB (N1_C) and will receive the missing server entries. Finally, as when a steady state (if no machines are removed or shut off) has been achieved, the browse lists will appear as shown in Browse Subnet Example 4. Synchronizations between the DMB and LMBs will continue to occur, but this should remain a steady-state operation. Names of computers on each side of the inaccessible network fragments will be maintained for as long as 36 minutes in the Network Neighborhood lists. Attempts to connect to these inaccessible computers will fail, but the names will not be removed from the Network Neighborhood lists. If one of the fragments is cut off from the WINS server, it will only be able to access servers on its local subnet using subnet-isolated broadcast NetBIOS name resolution. The effect is similar to that of losing access to a DNS server. Many questions are asked on the mailing lists regarding browsing. The majority of browsing problems originate from incorrect configuration of NetBIOS name resolution. Some are of particular note. Samba's nmbd process controls all browse list handling. Under normal circumstances it is safe to restart nmbd. This will effectively flush the Samba NetBIOS name cache and cause it to be rebuilt. This does not make certain that a rogue machine name will not reappear in the browse list. When nmbd is taken out of service, another machine on the network will become the browse master. This new list may still have the rogue entry in it. If you really want to clear a rogue machine from the list, every machine on the network must be shut down and restarted after all machines are down. Failing a complete restart, the only other thing you can do is wait until the entry times out and is then flushed from the list. This may take a long time on some networks (perhaps months). Your guest account is probably invalid for some reason. Samba uses the guest account for browsing in smbd. Check that your guest account is valid. Also see guest account in the smb.conf man page. There is no LMB. Configure nmbd or any other machine to serve as LMB. You cannot log onto the machine that is the LMB. Can you log on to it as a guest user? There is no IP connectivity to the LMB. Can you reach it by broadcast? Most common defective hardware problems center around low cost or defective hubs, routers, network interface controllers (NICs), and bad wiring. If one piece of hardware is defective, the whole network may suffer. Bad networking hardware can cause data corruption. Most bad networking hardware problems are accompanied by an increase in apparent network traffic, but not all. A number of sites have reported similar slow network browsing problems and found that when the WebClient service is turned off, the problem disappears. This is certainly something that should be explored because it is a simple solution if it works. This type of problem is common when one client is configured to use a WINS server (that is a TCP/IP configuration setting) and there is no WINS server on the network. Alternatively, this will happen if there is a WINS server and Samba is not configured to use it. The use of WINS is highly recommended if the network is using NetBIOS over TCP/IP protocols. If use of NetBIOS over TCP/IP is disabled on all clients, Samba should not be configured as a WINS server, nor should it be configured to use one. If use of NetBIOS over TCP/IP is disabled, Active Directory is in use and the DNS server has been incorrectly configured. For further information refer to DNS and Active Directory. Cached references on your MS Windows client (workstation or server) to shares or servers that no longer exist can cause MS Windows Explorer to appear unresponsive as it tries to connect to these shares. After a delay (can take a long time) it times out and browsing will appear to be mostly normal again. To eliminate the problem the stale cached references should be removed. This does not happen automatically and requires manual intervention. This is a design feature of MS Windows and not anything that Samba can change. To remove the stale shortcuts found in My Network Places which refer to what are now invalid shares or servers it is necessary to edit the Windows Registry under HKCU\Software\Microsoft\Windows\CurrentVersion\Explorer\. Edit the entry MountPoints2 (on Windows XP and later, or MountPoints on Windows 2000 and earlier). Remove all keys named \\server\share (where 'server' and 'share' refer to a non-existent server or share). Removal of stale network links needs to be done on a per-user basis. Alternately, you can delete the shortcuts from the MS Windows Explorer in My Network Places just by right-clicking them and selecting Delete. Samba users have reported that these stale references negatively affect network browsing with Windows, Samba, and Novell servers. It is suspected to be a universal problem not directly related to the Samba server. Samba users may experience this more often due to Samba being somewhat viewed as an experimenter's toolkit. This results from the fact that a user might go through several reconfigurations and incarnations of their Samba server, by different names, with different shares, increasing the chances for having stale (invalid) cached share references. Windows clients do not expire these references thus necessitating manual removal. It is common for Open dialog boxes (for example; in Word and Excel) to respond very slowly, as they attempt to locate all of the cached references, even if they are not in the current directory being accessed.